With so many ultra-modern towers set to graze New York City’s sky in the coming years, it’s easy to presume the Big Apple’s skyline will soon be dominated by futuristic glass-and-steel skyscrapers. But tucked in the far edge of the borough’s Upper East Side is a high-rise that’s not looking to be the tallest or shiniest structure of the bunch, but the classiest. The one-of-a-kind edifice—inspired by gilded notions hand-plucked from the past—looks to recall the exquisite elegance of a bygone era. Offering 43 two- to six-bedroom homes with 27 unique layouts (including three duplex townhouses with cellars and two one-of-a-kind penthouses at the top, with prices ranging from $4.5 million to $35 million), 20 East End is set to become one of the most coveted addresses in town. 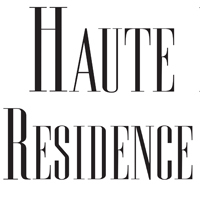 Haute Residence chatted with Edward Baquero, president of Corigin Real Estate Group, about the up-and-coming residential, the NYC-based developer’s latest undertaking. 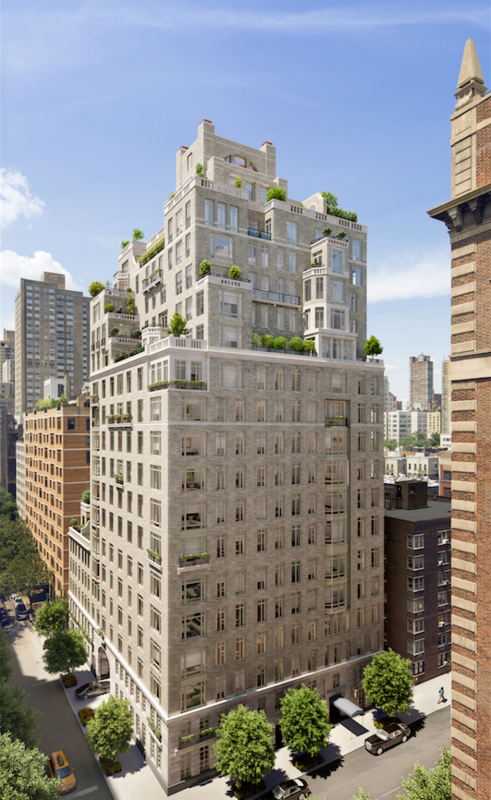 What sets 20 East End apart from other luxury residential buildings on the Upper East Side? Are any of the building’s features one-of-a-kind? Designed by Robert A.M. Stern Architects, 20 East End Avenue showcases incredible thought and consideration while retaining an intimate yet stately scale. It’s been designed to deliver a bespoke living experience, including generously scaled and elegantly proportioned residential layouts, 11- to 13-foot ceilings, extraordinary finishes, and unique amenity spaces that were designed to be a proper extension of one’s home. We were driven to consider even the smallest of details like no other building of its kind. 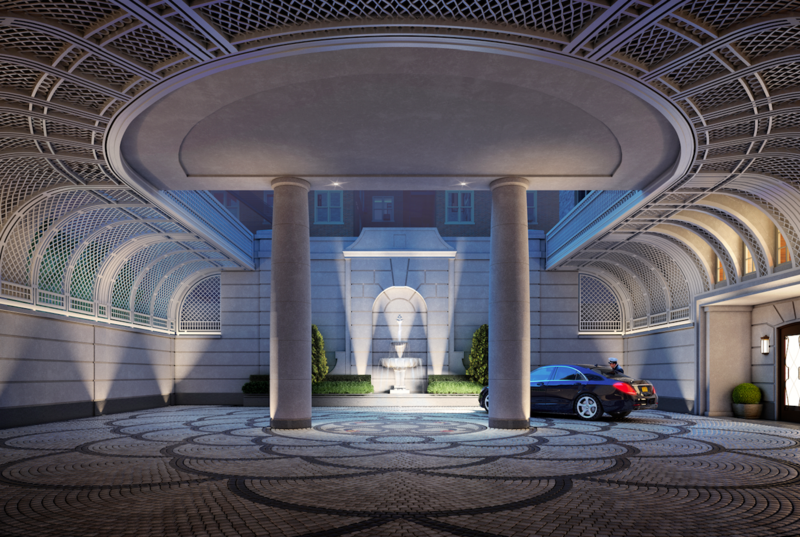 One aspect that sets 20 East End Avenue apart from other luxury residential buildings is its spectacular gated porte-cochére that opens up into a secluded motor court entrance on 80th Street. The extremely rare feature allows residents to enter directly and discreetly inside the building through the lobby door. The motor court features a landscaped courtyard complete with a hand-carved limestone wall fountain and a heated cobblestone driving surface, accented by two tones of granite and hand-set pale Indiana limestone walls. 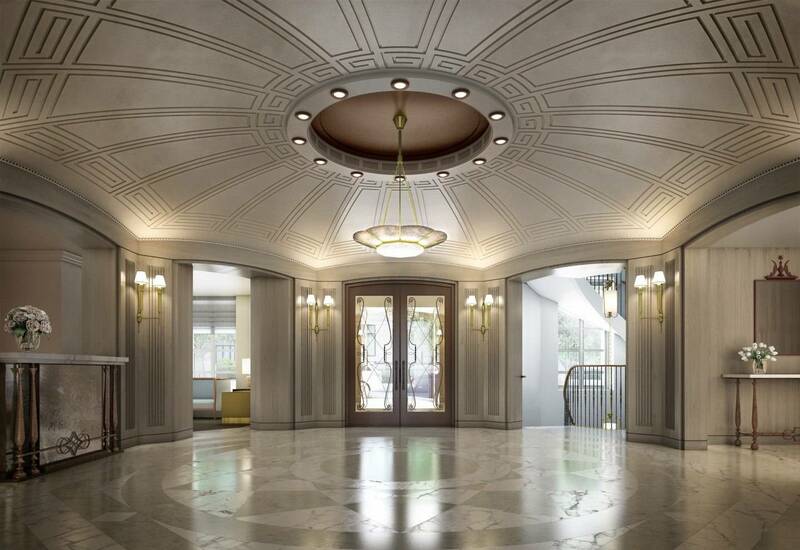 An elegant porte-cochère like the one at 20 East End Avenue hasn’t been developed in New York since the 1920s. Describe the building’s overall exterior aesthetic, and talk a little about the architectural firm commissioned to design the structure. 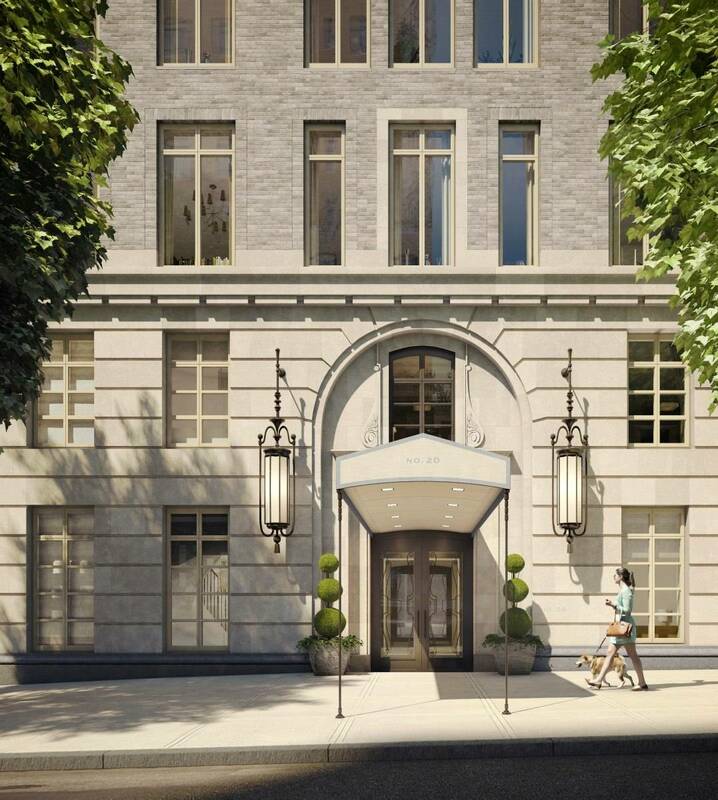 The design concept for 20 East End Avenue embodies the heritage of distinguished, pre-war architecture. The building’s intricate brick and hand-set pale Indiana limestone façade includes oversized bay windows to maximize each home’s natural light and views of the East River, Juliet balconies, and numerous setback roof terraces. Robert A.M. Stern Architects is a 330-person architecture, interior design, and landscape design firm based in New York with an extraordinarily diverse portfolio. Robert A.M. Stern is the preeminent scholar of early 20th century architecture. Stern’s designs are about perfecting a craft and embracing lessons learned through rigorous research and a study of the neighborhood’s content and history. A self-described “Modern Traditionalist,” Stern creates buildings that fit in seamlessly with their surroundings and give the impression they’ve been there forever. He was the perfect architect for 20 East End Avenue. What kind of vibe do the residences’ interiors collectively exude? With meticulous interiors by Robert A.M. Stern Architects, the homes feature 11- to 13 -foot ceiling heights; rift and quarter-sawn Appalachian white oak hardwood floors in a dark walnut finish; custom-designed paneled entry and interior doors; as well as moldings and casings designed specifically for the building. Many residences include oversized windows, private setback terraces, or gardens with outdoor gas or wood fireplaces. Several have beautiful interior gas fireplaces or some of the last city-approved, wood-burning fireplaces. 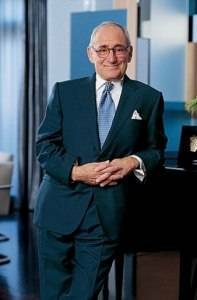 Every detail is custom-designed or hand-selected by Mr. Stern, which allows for the architecture and the interiors to work seamlessly together to create an unparalleled design. In what ways does the building reflect Stern’s philosophy and aesthetic? Robert A.M. Stern Architects’ reinterpretation of the classic pre-war façade at 20 East End Avenue has grown organically out of the fabric of the neighborhood. 20 East End Avenue’s two-story, handset base is a warm addition to the area, connecting it to the tradition of pale stone and brick pre-war buildings of that era. It is traditional going forward, and has been called Stern’s most intricate boutique residential building in New York to date. Describe the lifestyle 20 East End offers. 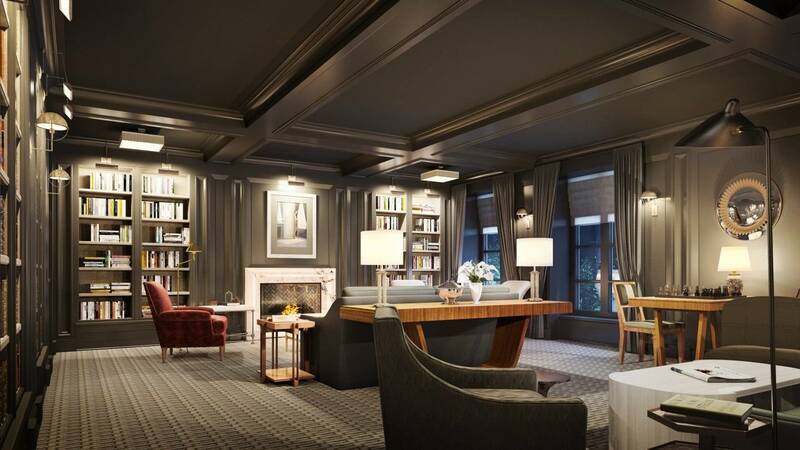 The lifestyle at 20 East End Avenue will resemble a very sophisticated, social, and exclusive club-like environment. We spared no expense on the amenity spaces at 20 East End Avenue. They are intimate and are designed with the highest level of residential quality. Upon arrival to the building through the circular motor court, residents will enter the lobby, [which features] a blackened steel sculptural staircase with marble treads and risers, a forged steel and bronze railing, and a breathtaking three-story bronze hanging pendant light fixture down the center. The three-tiered, circular staircase graciously connects its residents to the library on the second level, which features a fireplace and a handsomely-appointed library featuring a book collection on the history of New York personally curated by Stern. Adjacent to the library, through tall double doors, is a billiard room with a wet bar stocked with Christofle lead-crystal glasses and a wall of privately keyed lockers for each family to store its favorite cordials, perfectly located next to the property’s private card room. These second floor amenity spaces include expansive windows fronting East End Avenue, and are designed to extend each homeowner’s living environment. Taking the staircase down one level from the lobby, residents and their guests will enjoy an approximately 8000-bottle wine cellar featuring a private dining room with a vaulted ceiling, butler’s pantry and private, separate temperature and humidity-controlled wine storage units. In addition, the lower level will include a children’s game room; a sophisticated 3,000-square-foot fitness center and spa with high- and low-impact training rooms; private treatment rooms and a sauna; as well as a bicycle storage area. 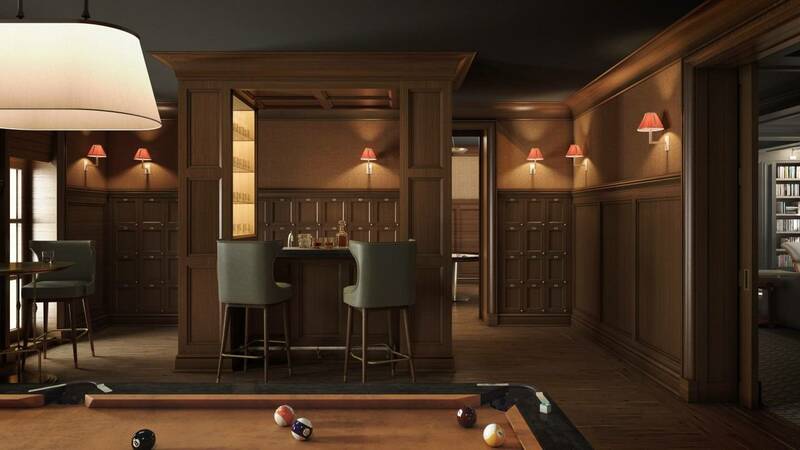 Residents will be able to reserve the billiards room, dining area, and wine cellar for private parties. The building will also include a 24/7 attended lobby concierge. Name a few features all of the residences share. All of the homes will feature 11- to 13 -foot ceiling heights; rift and quarter-sawn Appalachian white oak hardwood flooring stained in dark walnut; bespoke paneled entry and interior doors; and moldings and casings especially designed for the building. Many residences will feature private setback terraces, and a select few residences will include private gardens along with outdoor gas and wood fireplaces. Several will have interior gas fireplaces, while others will have some of the last city-approved wood-burning fireplaces. 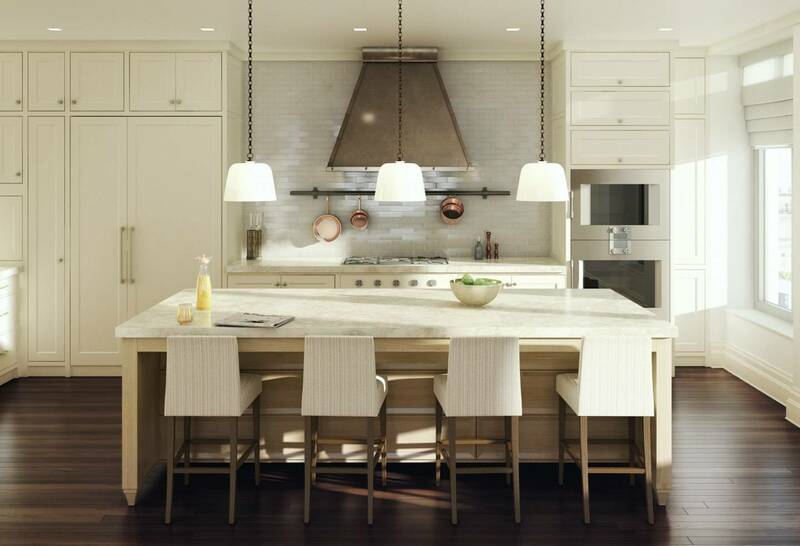 The Stern-designed custom kitchens feature millwork cabinetry and granite countertops with crackle tile backsplash. Hand-crafted custom islands designed in an imported marble/granite hybrid—finished in cerused oak with under-counter storage—serve as the showpiece of most kitchens. The kitchen appliances are provided exclusively by Gaggenau of Germany, including fully-integrated, stainless-steel-lined refrigerators and freezers; gas cooktops with a signature dark bronze exhaust hood; and the latest enamel encased speed ovens. The master bathrooms include three-piece crown moldings; a custom milk-glass vanity encased in a polished nickel frame with marble countertops imported from Italy; under-mount sinks; high-honed marble slab walls; WiFi-controlled radiant heated flooring; Toto water closets; and imported fittings from Lefroy Brooks of London in a polished nickel finish all throughout. Talk about the neighborhood surrounding 20 East End and the conveniences that come with living in the area. East End Avenue is a true residential enclave on the Upper East Side. It has the feel of a small town, with streets that end at the park. It is this intimacy that makes the area an “urban suburb,” benefiting from the very best of the Upper East Side in a riverside location that affords a sense of tranquility. It’s full of neighboring parks and the country’s best private and public schools including Chapin School, Brearley School, and Lycée Français De New York, which are a draw for the neighborhood. East End Avenue’s centerpiece is Carl Schurz Park, a 15-acre park designed by Calvert Vaux—the architect who designed Central Park—that borders the avenue from 84th to 90th streets. There residents can enjoy a playground, hockey rink, large and small dog runs, and several sculpted gardens, all alongside the East River. In addition, East End Avenue is in close proximity to green spaces such as John Jay Park and Asphalt Green, [not to mention] numerous summer festivals. With a location providing easy access to FDR Drive, East End Avenue enjoys convenient access to Midtown, the Hamptons, Westchester, and metropolitan area airports. There is simply no better place to live in all of Manhattan. Are there any residences presently available for purchase? To date, we have sold over 30% of the residences. We currently have a select number of two- to six- bedrooms available including a three-floor townhome with a private garden and separate entrance on 80th Street, as well as a duplex residence with over 450 square feet of private outdoor space. While all of the building’s residences are incredible and very unique, the two penthouses are spectacular. 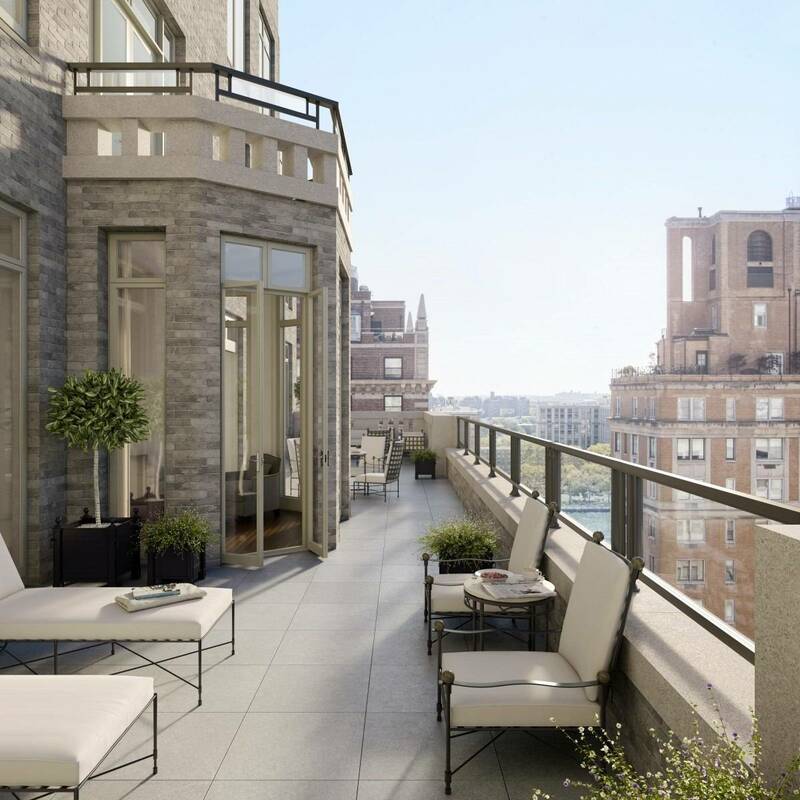 The penthouses range from approximately 6,000 to 6,300 square feet, and the top penthouse features 13-foot-high ceilings, five wood-burning fireplaces, and an expansive 5,000-square-foot-plus private terrace overlooking the Upper East Side and the East River.